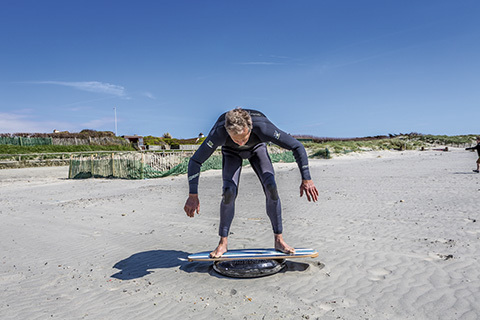 Windsurf MagazineFIT TO DROP - FIT FOR WHAT? FIT TO DROP – FIT FOR WHAT? Élite windsurfers are supremely fit. Lesser performers often aren’t. But, at recreational level, is fitness so very important in a sport, which is fundamentally about technique? If it is, what aspects of it are relevant and achievable to the common man or woman? 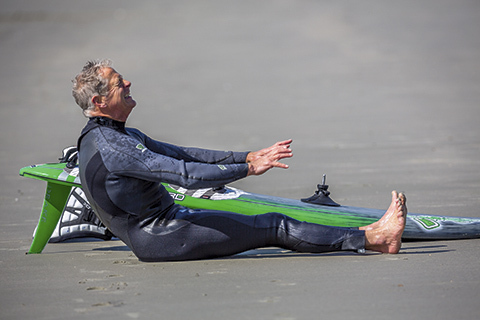 Peter Hart still has no need for a mobility scooter despite 35 years of windsurfing, so he must be doing something right. Windsurfers have an interesting, cyclical relationship with fitness. As they start out they are acutely aware of the physical challenge, especially as they move into the pre harness, semi-planing stage. “You need the arms of Thor and the palms of a coal miner for this lark”, “I have aches in places I didn’t know I had places” they cry. Then, as they discover the harness and hook into a fresh breeze for the first time … bliss! The transformation couldn’t be more stark if they walked from a torture chamber into a Turkish boudoir lined with shapely masseuses holding pots of strawberry yoghurt and wearing nothing but a suggestive grin. Suddenly windsurfing isn’t such a brutal physical challenge. “Perhaps I can do this and drive a desk for a living after all?” they muse. Modern, well set-up kit allows you to sail fast without too much effort. I don’t mean to be rude. Of course it does take a degree of strength and commitment but it’s a passive, anaerobic effort, sitting, resisting and generally not moving too much. The way to move off the blasting/free-riding plateau, you assume, is to engross yourself in the minutiae of technique. 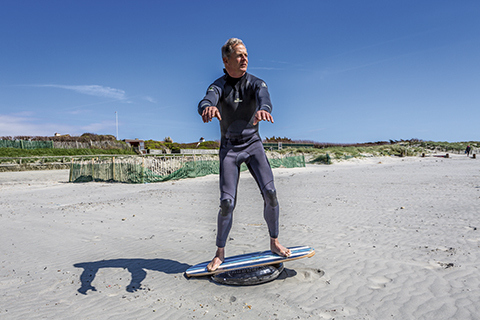 With better technique you can upgrade to more specialized equipment that allows you to work on slicker moves in more challenging conditions. 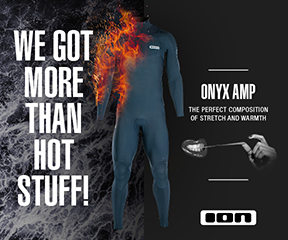 With better kit and more technical tools in the box, your confidence rises and suddenly you’re the real deal. If only … Progress, in my experience, is directly proportional to physical fitness for the job. Without it, you’re struggling on so many levels. It influences every aspect of your performance from decision making, to your state of mind, to your ability to actually function. In truth most, throughout their journey, register the need for fitness and regret their lack of it. But they still underestimate its importance. Those high on fat tend to rig too big because they need the extra power and volume to waterstart and get planing. Those short on muscle tend to rig too small for fear they won’t be able to hang on. A lack of fitness forces you onto unsuitable equipment. Technique. A lack of conditioning corrupts technique. If you don’t have the strength to hold your body weight on your arms, you’ll stumble into tacks and gybes the moment you hook out – and so initiate them off balance with arms bent. The fitter sailor will hook out and take a moment to balance and let the board settle. Unfit wave-sailors ride waves hooked in. That’s not the way to rip. To get planing the flabby sailor will resort to the more idle technique of sitting in the harness and hoofing against an over-sized fin, rather than pumping. Windsurfers who are unfit/stiff/tired tend to work within a very narrow cage of movement over the board because they don’t have the strength or confidence to hold themselves in dynamic positions. And how many falls do you see where people get trapped in the harness from staying hooked in for too long as they run into a lull? Skill. It’s that ability to move and balance instinctively and efficiently. Yes it’s partly genetic – some do it innately better than others, but fitness has a large influence. When you’re fit you have better proprioception. Your muscles contract faster. You balance better. The most effective way to balance is by flexing the feet, ankles and knees. But the legs contain the largest muscles in the body and so use the most energy. When you tire, you stop flexing them and balance instead by pecking at the waist and dropping the shoulders, which is the quickest way to lose orientation. And at the higher levels, it’s when you stop flexing the knees and ankles that you lose control of the edge in carved turns. Your mind. The suspicion that you might not be fit enough for the job destroys you mentally. If you’re tired, your vision closes in and you just react to what’s in front of you. If you’re fit, you tend to relax, lift your head, anticipate, make plans and take in the bigger picture. The unfit person confronting tough conditions for the first time only has survival on their mind, whilst the fit person enjoys the challenge because they know they have the strength and endurance to cope with a crisis. Your level of fitness determines your tactics on the water. Free-riders who sail 4 miles before gybing usually do so because falling and restarting big kit saps all their energy. De-tuned wave sailors, if they make it out through the break, keep going for a mile because they need to hook in and take a breather. Hence their wave count is low and their whole performance lacks intensity. The fear of a rinsing and an exhausting swim forewarns them from spending too much time in the crazy zone. So to improve at windsurfing it absolutely helps to get fitter. But how? At the end of the very first advanced ‘funboard’ instructor’s course in 1984, I asked the candidates to fill out course feedback forms as per RYA protocol. The comments were reasonably favourable apart from a collective rant about the pre-breakfast 5km run. “I started the day knackered. In retrospect, it wasn’t well conceived. The run was too strenuous and too early before the sailing session to be a useful warm up. And as a general attempt to make everyone fitter for windsurfing, it was a very blunt instrument. For those who didn’t run as a way to keep fit, it was way too brutal. For those who did (and there were a couple) it barely changed their heart rate. In my defence the general aim of the run was to serve as a wake-up call to basic instructors who spent a large portion of their working day sitting in a boat wrapped in a duffle coat, with a cup o’ tea and loud hailer bellowing at beginners to keep their bums in. 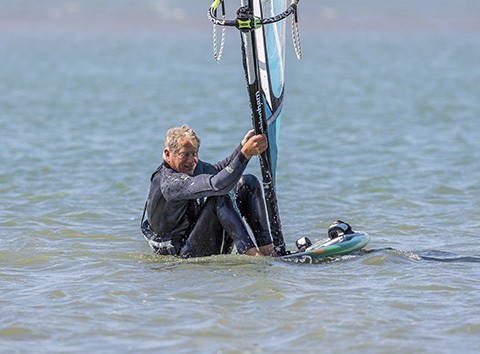 Windsurfing, and coaching, at the more advanced levels is physically very demanding. It’s a daily triathlon of sailing, swimming and sprinting around the beach. Get fit or go home … but not necessarily by pounding the streets of Cowes. Training, the volume, intensity and type, has to be relevant to the individual and what they want to achieve. The fitness world is a commercial jungle. Exercise gurus with a magic product may claim to be able to give you perfect abs in 6 weeks (and produce a study and a ‘Doctorate of Ab-ology’ to back it up). But they can’t. For a start that study didn’t include you did it? And what sort of fitness are they selling? Pert glutes and plump pecs may be desirable, but will they help you plane earlier? So perhaps the best starting point is to consult expert windsurfers? They might not have the right letters after their name to be able to offer the definitive windsurfing work out, which doesn’t exist anyway, but they will have anecdotal experience of what has worked for them. I was sat last week at a conference with a handful of icons of the sport past and present, including Ross Williams, Nik Baker and Dave White, who have reached various pinnacles with very different body types and attitudes to training. The following may seem as logical as getting Hitler to deliver a sermon on racial harmony, but I’m going to give the first word on fitness and training to speed phenomenon Dave White. Whitey, for those who haven’t had the pleasure, has the dancing feet of Nureyev, but the physique of Mr. Blobby. That’s unfair. He just has a classic endomorph body – solid, heavy boned, strong but prone to putting on kg. easily (and then reluctant to get rid of them). He’s waged a long and bitter war with his weight, which currently he seems to be winning. Having indulged in a myriad of diets, from Atkins to protein shakes – and exercise regimes – he has this to say about conditioning. There lays my problem – no not my marriage – I didn’t enjoy the training I was doing and so I didn’t carry on. Right now I’m on the fitness path, not from outside pressure, but as the result of some great sailing on the right size and style of equipment that fills my every waking moment with thoughts of windsurfing. If someone puts you on a diet of llama’s intestine and boiled swede, however much weight you may lose initially (probably through retching), you are very unlikely to make such a regime part of your life because you’ll dread meal times and will surely revert and regrow. It’s the same with exercise. In some perverse way you have to look forward to it. Back at the conference and I’m about to have a chat with Ross Williams when Amy Carter (coach and herself a Crossfit fanatic) enquires incredulously “you’re going to talk to Ross about physical training…?” inferring, I guess, that he doesn’t do much. I have a lot of time for Ross. If the PWA still offered an overall crown he’d be favourite. He rips in the waves but is perhaps best known as a slalom and Formula racer. Have you ever hung on to dedicated slalom kit in race conditions? You should try it once. The forces going through every cell of the body are brutal. Ross is built – but he doesn’t look like a gym monkey. If the symptoms of someone on steroids are short-tempered, aggressive, border-line psychotic with veins bulging from parchment skin, well Ross is definitely clean. Smiley and laidback to the point of collapse, his approach to the fitness question is that of a waterman. “Whenever I get the chance, I surf – and I will do it because I enjoy it and from a fitness point of view it’s harder than windsurfing! But for me I relate my performance entirely to the time I spend windsurfing. It’s all about muscle memory and developing the right muscles. Yes I know not everyone can get out there when the wind blows so from personal experience I would say: don’t be totally unfit – any activity is better than none. From the age of 10 to 16 ½ I trained seriously as a gymnast. Lucky for me my coach, Bert Dooley, was something of a visionary. Bert believed that all strength and conditioning training had to be directly relevant to the sport and what we wanted to achieve. Heaving dumbbells around, he said, would just build big, irrelevant muscle. All his conditioning exercises, therefore, used the apparatus and your own body. For example we’d do sets of swinging dips on the parallel bars, (with ankle weights if he was feeling mean), push-ups from head to handstand. Leg circles on the pommel horse. We’d do shuttle sprints, but at the end of each have to do a vault or a tumble – and many more. Each exercise was designed to target a muscle group but because it was part of a balance movement, you were working all the smaller muscle groups as well. And everything had to be done with a tight stomach. Tension is key in gymnastics, and indeed anything acrobatic or dynamic. You’ve probably seen the TV bloopers, where a gymnast loses that tension in mid-move, they fall from the sky like a dying spider. Basically we were doing high-performance Pilates before it was called that. a) He introduced an element of competition. b) We were actually doing the sport, not just grunting. c) There was a technical incentive. If you held balance and form, the repetitions were a lot easier. He also kept the exercise bursts to around 90 seconds, just a bit longer than the length of a competition routine, which these days is called, ‘training above race pace.’ Gymnastic is an intense, explosive sport, so our conditioning training was explosive and intense. 1. 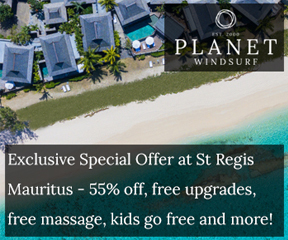 If it’s windy – go windsurfing! Set aside part of the session, perhaps the end, to conditioning. Intensify the session. Get planing without hooking in. Try stepping straight into the straps and pumping from there. Count the pumps. Try sailing out of the harness for longer and longer periods holding the hips high and the stomach as tight as possible. Do a series of ‘pops’ or chop hops without hooking in, on each tack. If you’re sailing in waves, sail in the waves! Imagine you’re in a 20-minute heat and have to complete 5 jumps and 5 rides and stay in the same spot. You’ll crawl up the beach. The All Black rugby team draw the difference between ‘man strength’ and ‘gym strength’. Man strength is the natural strength you develop over years from continuously performing a physical chore like chucking sheep into the back of a truck. Gym strength is just the ability to lift a weight and grow a muscle. 2. Don’t be a WINDGURU SLAVE. In light winds, still go windsurfing. It’s the same exercise, same techniques but, without a solid counterbalance, it’s potentially even more demanding, if you make it so. Gybe or tack continuously so you have little time to hook in and relax. Light wind sailing in the waves on a floaty thing can be the most aerobic of all. 3. Little wind – on the beach. So there’s barely enough wind to windsurf. 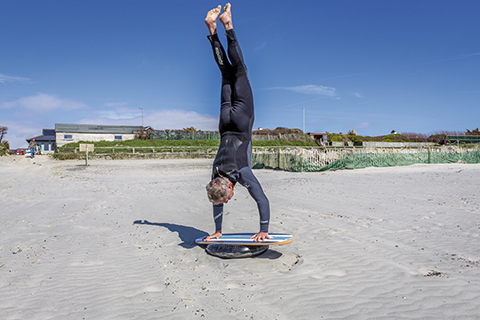 But you can lay an old fin-less board on the beach, fit it with a small sail and get twiddling. See how many tacks or rig changes you can do in a minute – you’re working the right muscles and drilling a technique. 4. No wind and the SUP. 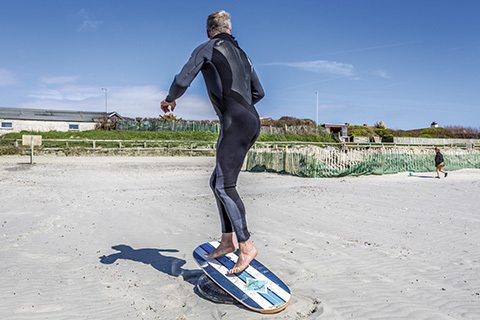 The SUP has transformed many a windsurfer. 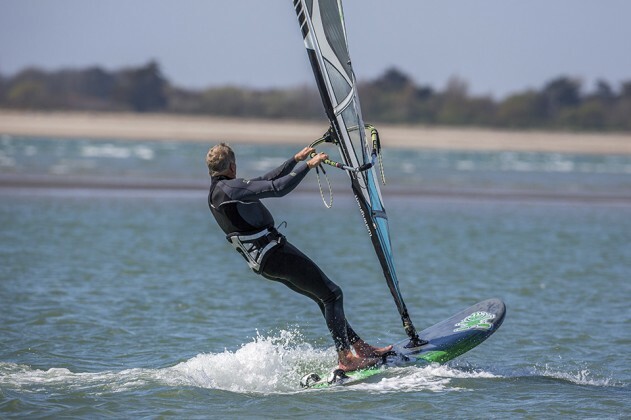 Learning to balance and turn without a counterbalance is brilliant exercise for windsurfers who often use the rig like a drunkard uses a lamppost. And when it comes to cardiovascular training, if you get it as a by-product of doing a sport you enjoy, rather than grinding it out on a static pain machine, you’re far more likely to persevere. And finally, if the water is not available through weather or lack of general proximity then you do have to find something else to do. For aerobic training everyone has their own favourite tools, running shoes, a bike, a swimming pool. Personally mine is the Concept 2 indoor rower. 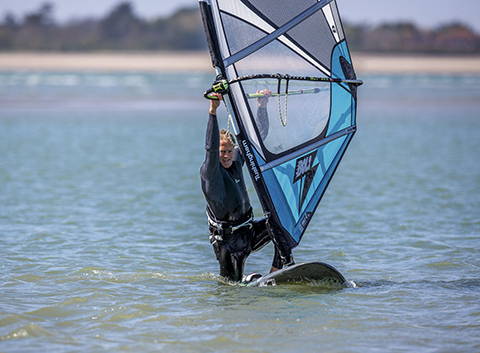 I say ‘favourite’ – I hate the bloody thing, but being a supported exercise it’s easier on my dodgy knee and I have yet to find anything that better mirrors the act of windsurfing. But whatever tool you’re on, think windsurfing and replicate its rhythm and intensity. It’s periods of relative calm (hooked in reaching) followed by short explosive bursts (a gybe, a jump, a tack, gouging bottom turn). So if you’re on your step machine, program in hills. If you’re on your bike, find hills. If you’re running, look for a hill or put in the odd sprint. Once, after 2 months of heavy gym training I flew to Barbados for a regatta. On the first morning I met up with fellow racer Mike Burt. He too had been on the weights. We compared pecs – it was official, we were both ripped. We went out into the waves – we came back in 5 minutes later both totally knackered and feeling like we never windsurfed before. Some regimes, notably heaving big weights around, can actually be counter-productive in a sport that is primarily about balance. According to the well respected Journal of Applied Physiology “overload is the one overriding truth in physiology.” You go the gym and do the same old circuit, it may have general health benefits, but you’re not getting any fitter. To get fitter you have to push yourself and ‘overload’ the system and actually damage the muscles and connecting tissues. You’re no doubt familiar with DOMS (Delayed Onset Muscle Soreness). That soreness is not lactic acid but tiny muscle tears that have brought an inflammatory response. The tissues then repair themselves and become stronger and more pliable – but only if they’re allowed to – which is why rest and recovery is so important. It is the foundation of fitness. My body reacts far better to high intensity, interval training (HIIT in the trade) than it does to lower intensity volume training. I’d also rather dive into a freezing swimming pool than edge in inch-by-inch – and pull off the Elastoplast in one rip. Get it over with I say. I’d rather hurt a lot for a short time, than a hurt a little for a long time. But overload does not have to imply a ‘sprint ‘til you vomit’ approach. It can simply mean gradually increasing the frequency, length and/or intensity of your workouts. Are you a ‘Non responder’? As mentioned in the beginning, people respond differently to the exercise. A recent study in Finland put 175 people through the same aerobic and strength program. After 21 weeks some had improved by as much as 42%, others, not one iota. Some of you may have seen last year’s BBC Horizon program ‘the truth about exercise’ where the presenter sought an exercise regime to reverse the descent towards ill health, notably diabetes, that had been the fate of his ancestors. The researchers identified him as a ‘non responder’ to exercise. That is to say he could run or cycle as much as he liked and he wouldn’t change his VO2max – his ability to process oxygen. However, by obeying a shockingly brief daily routine of 3 X 20 second full sprint bursts on a static bike, he altered positively many of his health markers including his sensitivity to insulin. I do encounter people on courses who love their windsurfing, but who have thrown in the exercise towel claiming that nothing seems to make any difference. But I’m afraid if you are such a person it is probably that you’re just not trying hard enough in the right way … sorry! Your gym, fearful of litigation, may be to blame. With notices like: “if you feel tired or hot or short of breath immediately stop, go home, have a little lie down and call a doctor” plastered on every machine, no surprise people remain a little too comfortable. When all is said, motivation is often the elusive ingredient. And it’s the same for the elite sportsman as it is for the amateur. Hence the pro usually trains with a view to peaking at a certain time – like a 3-year plan leading up to the Olympics for example. The amateur can do the same – just shorten the lead time and swap ‘Olympics’ for ‘holiday.’ It should be a massive incentive. It’s tragic how many holiday sessions have been wasted because the perpetrator went nuts on the first morning and by day 3 hadn’t got a functioning cell left in the system. “For me it’s the possibility of maximizing the conditions when they finally arrive that keeps my thoughts positive as I pass (without stopping) yet another McDonalds or when my heart feels like bursting through my chest on a run…. Yes, I did say “run”. P.S. If you’re interested in the latest fitness science in layman’s language may I suggest you read ‘The First 20 Minutes’ by Gretchen Reynolds. Harty continues the physical theme in this month’s Affairs of the Hart’ on the back page. Next month he hits the technique looking at the Freemove phenomenon. Many of his life-enhancing clinics are full this year but a few spaces remain. Check them out soon by going to www.peter-hart.com, or by liking his Peter Hart Masterclass Facebook page.